We use a battery of computerized neuro-cognitive testing that is specifally chosen for each individual based on their personal needs, risk factors and age. Our team of specialists can assist youth sport organizations, high schools and community organization in organizing and running group baseline testing. If you are interested in Group Testing, please call the office for more info. If a concussion is suspected, we ask that you call our office for evaluation. We would like to see you or your child within the first 48-72 hours after an injury. During this initial visit we will preform a comprehensive neurological, balance and physical exam. We may choose a to perform computerized neuro-cognitive testing to assess for changes in the way your or your child’s brain functions after the injury. If a valid baseline is available, it will be used as a comparison to assist in determining when you or your student-athlete is back to their baseline cognitive functioning. In the event a valid baseline is not avaialable, we will use normative data to assist us in determining if you or your student-athlete is at or near your baseline cognitive ability. Computerized neuro-cognitive testing does not diagnose a concussion but inform the medical practitioner if there is a change in you or your child’s brain function after an injury. In the event that we feel computerized neuro-cognitive is not an appropriate tool to measure you or your child’s cognitive functioning we will refer you to our neuro-psychologist Dr. Tricia McDonough-Ryan for traditional pen and paper neuro-cognitive testing. The decision to return to play can often be difficult at times. It requires a multidisciplinary team of healthcare practitioners to develop a stepwise individual plan of care that gradually increases your mental and physical exertion. Once the athlete is able to attend a full day of school or work without concussion symptoms than an exercise program maybe initiated. Our physical therapist will work with you or your child to develop an exercise program that increases your physical activity gradually while monitoring for concussion symptoms. 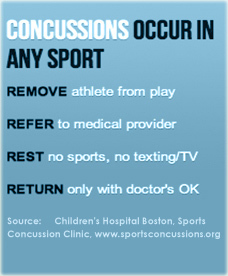 The Concussion Center follows the following three criteria before clearing a person to return to sports. You or your child must be without concussion symptoms at rest, with activity and have a normal to near normal neurocognitive test. We will evaluate these criteria at each of your follow up appointments and will adjust your plan of care according to your progress until you are cleared to return to sports. Individuals who sustain a concussion often report a constellation of physical, cognitive and emotional/behavioral symptoms that usually resolve within three weeks. In some individuals concussion symptoms persist from months to years following and injury and may even be permanent and cause long term disability. When this happens, it is called post concussive syndrome or persistent post concussion syndrome. Because of the life alternating potential consequences of these symptoms the use of a multidisciplinary team to assist in the prevention and treatment of this disorder is essential. The Concussion Center provides individuals who are experiencing post concussive syndrome the latest research based medicine and neuro-psychology to assist them in their recovery. This includes detailed neuro-psychological and medical evaluation, use of cognitive behavioral therapy, cognitive and physical rehabilitation and possibly medication. After a concussion an individuals balance maybe impaired causing dizziness, lightheadedness, unsteady gait, blurry vision, motion sickness and difficulty in busy visual environments such as the store, school hallways. The vestibular system is responsible for sensing and perceiving motion as well as producing reflexive movement of the eyes and limbs in response to head motion which properly stabilizes and orients our bodies to the line of gravity. Basically, the vestibular system is essential for proper balance. After a concussion, this system can be impaired and the use of vestibular physical therapy can assist the individual in restoring function. Vestibular physical therapy uses specific exercises incorporating eye and head movements to improve gaze stabilization while incorporating multiple balance challenges with eyes open and closed. A full evaluation by a physical therapist trained in vestibular therapy and concussion is valuable to assess for impairment in balance along with any musculoskeletal injury that maybe associated with a concussion. The use of soft tissue massage and range of motion exercises at targeted areas of concern is effective in decreasing neck/spinal pain and headaches often associated with concussion. Once the client is asymptomatic at rest, the physical therapist will have the client progress through a graduated exertional exercise program to prepare the client to return to previous level of activity safely including sports. This involves a closely supervised aerobic exercise program using a treadmill, bike and functional agility activities while monitoring heart rate and symptom response. Patient and parent/guardian education regarding monitoring of symptoms will be provided and is an important aspect of the treatment plan to provide for maximal outcome. Concussions not only affect the person who has the injury but other members of the household as well. An injury to a child or family member creates stress in the household. The patient is often dealing with trying to recover from the injury while not falling too behind at school, work or missing too many games. A parent must deal with the worry and concern regarding their child’s health along with the pressure associated with potential loss of work and changes to their daily schedules. It is a stressful time for all members involved. On occasion emotional/behavioral symptoms such as anxiety or depression may occur post injury and some individuals may have anxiety or depression prior to the injury. Identifying these symptoms is important in facilitating the individuals healing from concussion, as these symptoms may disguise or exacerbate a concussion. The use of counseling has shown to be effective in decreasing associated emotional/behavioral symptoms associated with concussion. Our trained professionals are experienced in the effect a concussion can have on oneself and a person’s family. Effective use of counseling can assist both the patient and the family in the recovery process. Counseling, specifically cognitive behavioral counseling maybe recommended if you or your child is suffering with post concussive syndrome. Because all concussions result in impairment of how the brain functions, the use of neuro-psychological testing to measure brain function is recommended for the management of concussion. The Concussion Center uses a battery of computerized neuro-cognitive test as a tool to assist with the neuro-cognitive evaluation recommended post injury. These computerized neuro-cognitive programs have been shown to be valid and reliable in assisting in the management of concussion. Understanding that we are all different and each concussion along with each individual concussion is different the use of traditional neuro-psychological testing by our pediatric neuro-psychologist Dr. McDonough-Ryan who is experienced in concussion management/traumatic brain injury maybe required. A formal neuro-psychological evaluation maybe recommended for individuals with certain learning disabilities/ impairments, co-existing mental health disorders and/or those with post concussive syndrome. We know that concussions lead to cognitive impairment and for some these impairments may persist for months and even years, therefore the use of cognitive rehabilitation/remediation maybe recommended. Cognitive remediation is a behavioral treatment that uses drill and practice, compensatory and adaptive strategies to facilitate improvement in targeted cognitive areas like memory, attention and problem solving. Cognitive remediation aims to improve cognitive impairments associated with a concussion which are making it difficult for a person to achieve their functional goals and is often recommended in the treatment of post concussion syndrome. The Center will be providing training sessions and workshops on concussions throughout the year. Please register on our website to receive the latest news and updates on training and workshop sessions. If you are interested in having one of our healthcare professionals speak at your school, youth sport organization or place of employment please contact us for more information. All of our experienced healthcare professionals are available for consultation. We are happy to work with your pediatrician, nurse, athletic trainer, school or coach. Please call our office for more information. As The Concussion Center grows, we will be looking to perform and participate in concussion research. We would like to add to the ever growing body of medical knowledge that is assisting healthcare practitioners in the prevention, identification, treatment and management of concussion.